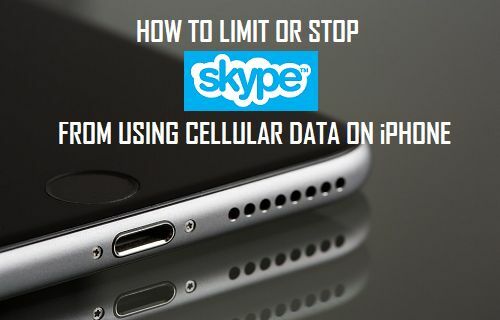 If you are on a limited data plan and using Skype to keep in touch with family and friends, you will find below the steps to Limit or Stop Skype from using Cellular Data on your iPhone. 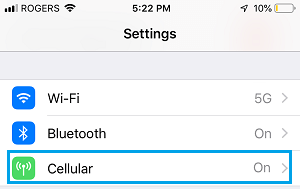 Follow the steps below to completely stop the Skype app from using Cellular Data on your iPhone. 2. On the next screen, scroll down and turn OFF the option for Skype to use Cellular Data on your iPhone. This will totally prevent the Skype App from using Cellular Data on your iPhone and it will only be restricted to WiFi Network. You need to be aware that disabling Cellular Data for the Skype App on iPhone will prevent you from placing and receiving Skype Calls while you are connected to Cellular Network. You will be able to make Free Skype calls only while your iPhone is connected to WiFi Network. 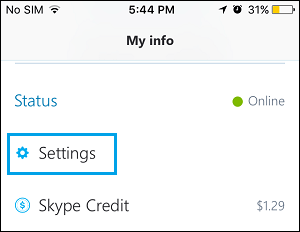 If it becomes necessary, you can toggle ON Cellular Data for the Skype App at any time on your iPhone by going to Settings > Cellular > toggle ON Skype. In general, sending simple text messages using the Skype App is not going to use much data. It is only while making Skype Video Calls, sending large Media Attachments and receiving Video and Media Attachments that Data Usage by Skype tends to be higher. Hence, follow the steps below to restrict Skype Video Messages to only the WiFi Network on your iPhone. This will stop Skype from using your expensive Cellular Data to download Video Messages. 1. Open the Skype App on your iPhone. 2. Next, tap on My Info tab located at the bottom of your screen. 3. On the “My info” screen, tap on Settings. 4. 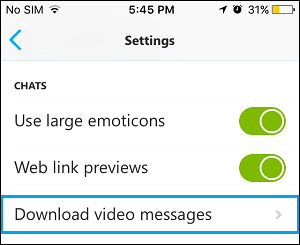 On the Settings screen, Scroll down and tap on the Download Video Messages option. 5. On the next screen, tap on WiFi Only option. 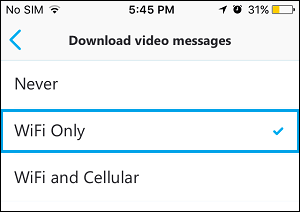 After this setting, any Video Messages that you receive on Skype will only be downloaded to your iPhone while it is connected to WiFi Network. As you will agree, Video Messages are generally large in size and can end up consuming a large amount of Cellular Data. Hence, preventing Skype from using Cellular Data to download Video Messages should result in considerable Data Savings on your iPhone. Apart from Skype, Social Media Apps like Facebook and Twitter may also be consuming excessive Cellular Data on your iPhone. Hence, make sure that you take measures to reduce Cellular Data usage by Facebook and Twitter on your iPhone.